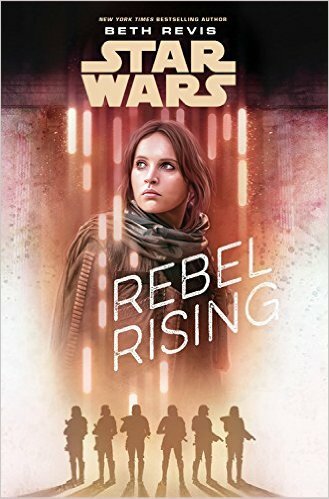 Rebel Rising by Beth Revis follows Jyn Erso’s life and struggle from age 8 to age 26 when she officially joins the Rebel Alliance (i.e. the events shown in Rogue One.) 18 years is a lot of ground to cover, but Revis does so in an engaging way that effectively shows Jyn’s character arc and how she moves into the mind set she’s in by the time the Rebels recruit her. After Saw Gerrera rescues her from the bunker on Lah’mu, Jyn starts a new life at his secret base on the planet Wrea. Wrea, perhaps coincidentally, is described as looking quite like the island Luke is on at the end of The Force Awakens….not sure if this was on purpose or not. Maybe I was reading too much into it. Anyway, Saw relentlessly trains Jyn as a soldier and cunning forger from a young age. Their bond becomes that of father and daughter, although Jyn often wrestles of fears of being abandoned again (because of the actions of her true father, Galen Erso.) Jyn witnesses Saw train and plan missions with other rebel cells, all the while having to keep her true identity secret. At 14, Jyn is finally allowed to go on her first mission although her role is small. As Jyn becomes more accepted and trusted among Saw’s rebels, she quickly takes on the role of master forger. She even seems to have a talent for it; forging documents, codes, identities, etc. She begins to own her abilities, despite her misgivings about some of Saw’s more drastic and brutal tactics. Throughout the years, Jyn hears nothing of her father and basically has the same outlook toward him as she does in Rogue One. For all intents and purposes, he is dead to her. In an effort to be somewhat spoiler-free, I will just say that the catalyst for Saw abandoning Jyn at age 16 is due to a failed and violent mission, as well as rebels’ suspicions about Jyn’s true identity that he alludes to in the movie. For the next 10 years, Jyn drifts around the galaxy doing odd jobs and living hand to mouth. She doesn’t stay anywhere too long after her year and a half (ish) stay on a planet where she lives and works with a mother and son. She even develops a romantic relationship with the young man–a relationship that offers some consolation for the fact that we know Jyn dies too young. At least she was able to find and have love for a brief time. But it is brief, and the new relationships she forms only lead to heartbreak and grief. Soon after, Jyn steels herself. She becomes detached from any and all personal relationships or loyalties. She hates both the Empire and the Rebellion. She is only concerned about her own survival; about getting the next odd job, meal, credits, or ship off planet. The journey Revis has crafted for Jyn fits perfectly with who she is at the beginning of Rogue One. She is closely guarded and jaded, and little wonder considering all the hardships and loss she has suffered from both the Empire and the Rebellion. She’s an isolationist to the core, with no hope to light her way. Which brings me to my next point: for a YA book, Rebel Rising was quite dark and adult. Before reading, I had some trepidation about the book’s YA status, and if you’re weary of that as well–don’t be. Rebel Rising is anything but juvenile. Revis does not shy away from the dark, violent parts of life and the horrific things Jyn witnesses at such a young age. The reader even begins to wonder why Jyn goes on if she often thinks there is no point to her life. Perhaps, deep down, she did have a tiny spark of hope about her father after all. And as Rogue One proves, that buried and tiny spark was enough to embolden her to become the Jyn Erso we know; a woman who makes a rousing speech about hope and standing up to the Empire. Overall, Revis effectively creates a believable character arc for Jyn that seamlessly merges with Rogue One.